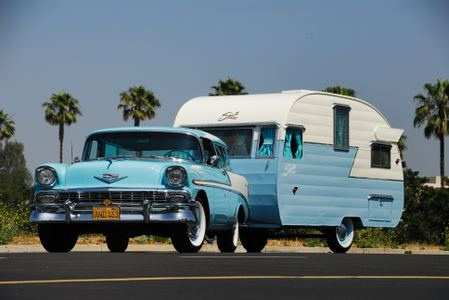 RV Campers have been around since the beginning of RV Travel Trailers and RV camping! They started out as little tiny campers pulled behind the family car or station wagon and have gotten very fancy over the years! The majority of RV campers today are pulled behind a large pickup truck and have most of the amenities that a house would have – but a smaller scale! Today’s RV Travel Trailer will have 1 to 3 axles holding it with a self contained braking system. The newer the camper, the smoother the outer skin! Some will have large windows, while others seem to be just a structure on wheels. 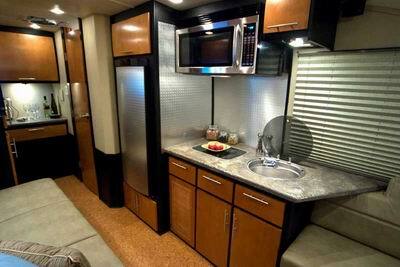 Here's a Very Beautiful, Well Built, Modern Looking "Camper"
The insides of this camper can be quite luxurious! Larger and or multiple beds, a full kitchen with a pretty good sized “camper refrigerator”, kitchen sink(s), a 2 or 3 Burner Propane stove, countertops, TV’s, a nice stall shower and a full commode/sink area. A far cry from the beginnings of the campers of years ago! Storage is designed for temporary usage – not too easy to live in a camper on a full time remote location area - in a RV campground would be fine. The fresh water and dumping tanks are not built or designed for large capacities; the propane tank(s) are small, usually no generator or large battery storage banks. The best part about a Camper is they can be loaded and on the road for a quick family getaway in minutes – without a special vehicle designed to pull them! Obviously, the really big long campers will need a bigger SUV or pickup to handle them, but many can still be pulled be the family car – loaded with the kids for the weekend getaway – that’s what RV’ing is all about! Some benefits of today’s RV campers are the price – very affordable for just about any family, built to last for years, will keep you dry when it starts to pour rain and just a great fun vehicle to escape for a weekend with the family. On the down side, the propane tanks are not permanently factory installed and therefore you’re restricted from most tunnels in the larger northeast US cities, smaller storage, need a good quiet generator and usually will require extra water jugs and disposal tanks.